The greatest Nazi-killer of the 20th century was Josef Stalin. He also killed millions of his own people and terrorized, oppressed, enslaved or brutalized tens of millions more. Nazism was evil. Soviet Communism was evil. It’s fine to believe that Nazism was more evil than Communism. That doesn’t make Communism good. Yet confusion on this point poisoned politics in America and abroad for generations. The young Communists and fascists fighting for power in the streets of 1920s Germany had far more in common with each other than they had with decent liberals or conservatives, as we understand those terms today. The second part of the problem wasn’t innocent confusion, but sinister propaganda. As Hitler solidified power and effectively outlawed the Communist Party of Germany, The Communist International abandoned its position that socialist and progressive groups that were disloyal to Moscow were “fascist” and instead encouraged Communists everywhere to build “popular fronts” against the common enemy of Nazism. These alliances of convenience were a great propaganda victory for Communists around the world because they bolstered the myth that Communists were just members of the left coalition in the fight against Hitler, bigotry, fascism, etc. This obscured the fact that whenever the Communists had a chance to seize power, they did. Often, the first people they killed, jailed or exiled were former allies. That’s what happened in Eastern Europe, Cuba and other places of Communist success. This history is relevant today because of the depressingly idiotic argument about whether it’s OK to equate “antifa” — left-wing radicals — with the neo-Nazi and white supremacist rabble that recently descended on Charlottesville, Va. The president claims there were “very fine people” on both sides of the protest and that the “anti-fascist” radicals are equally blameworthy. He borrowed from Fox News’ Sean Hannity the bogus term “alt-left” to describe the antifa radicals. The term is bogus because, unlike the alt-right, nobody calls themselves “the alt-left.” That’s too bad. One of the only nice things about the alt-right is that its leaders are honest about the fact that they want nothing to do with traditional American conservatism. Like the original Nazis, they seek to replace the traditional right with their racial hogwash. The antifa crowd has a very similar agenda with regard to American liberalism. These goons and thugs oppose free speech, celebrate violence, despise dissent and have little use for anything else in the American political tradition. But many liberals, particularly in the media, are victims of the same kind of confusion that vexed so much of American liberalism in the 20th century. 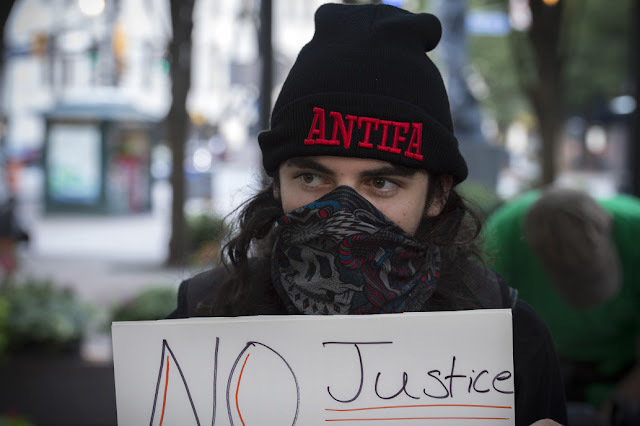 Because antifa suddenly has the (alt-)right enemies, they must be the good guys. They’re not. And that’s why this debate is so toxically stupid. Fine, antifa isn’t as bad as the KKK. Who cares? Since when is being less bad than the Klan a major moral accomplishment? In these tribal times, the impulse to support anyone who shares your enemies is powerful. But it’s a morally stunted reflex. This is America. You’re free to denounce totalitarians wherever you find them — even if they might hate the right people. NO ONE calls them self the ALt Right. It is a term used by the left, so the use of the term Alt Left is just as valid. Unfortunately the kooks are only a minor part of the right but make up a major portion of the left wing agenda. To the left if you go to church pay taxes and believe in following the law you are an extremist in their eyes. To them moderates are borderline extremist. What many do not know about AntiFa is it's origin. AntiFa was created during the Spanish Civil war by Communist International. Their job was to be street thugs and go around and silence any opposition to the Communist movement. It was a violent time in Europe when Fascism and Communism was battling it out for control. Both violent totalitarian forms of government and anti democracy. Since the end of WW2 communism had been responsible for the deaths of over 100 MILLION people around the world. And while it is failing around the world it still has followers who believe it is a utopia and push it on the world. Mainly these day in the hallow hall of academia is where you will find the leaders of the movement. Safe and secured in their ivory towers never setting foot in the real world and never having to worry about the effects of their failed ideology.